Teodor Celakoski is a project coordinator at Multimedia Institute, Zagreb. 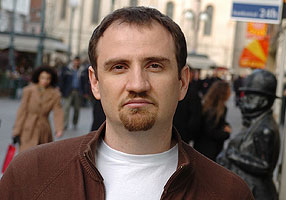 In the last ten years he initiated several projects and platforms focused on advocating change in the Croatian cultural policy field, in particular confronting the issues of development of non-institutional culture and civil society, like Clubture (the nation-wide program exchange platform for non-institutional culture), Zagreb Culture Kapital of Europe 3000, Alliance for Center for Independent Culture and Youth. Recently he is engaged with The Right to the City campaign fighting against devastation of public spaces in Zagreb and Croatia. He also initiated numerous projects dealing with social and cultural aspects of new technologies and new media, including NGOs: Labinary, radio.active and Multimedia Institute. He is a board member of the National Foundation for Development of Civil Society and a fellow of the International Policy Program at the CEU.